I will admit, having no updates since last October some six months ago is not doing many of you any favours. Allow me to bring you up to speed. In my hand is the cumulation of some hundreds of hours worth of work. Many evenings and weekend mornings building these at my workbench, plus a few made elsewhere over these past six months and they are all done! 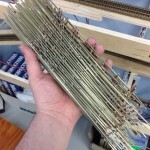 Unless anything serious goes wrong, I won’t need to make another turnout for this layout. 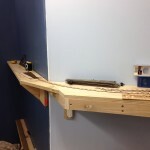 I decided that the track plan for the plywood division wasn’t quite up to snuff and decided to extend the benchwork for it around the corner and into the stairwell. The trackage to the prototype was such that a train would continue out of the south/timetable west end of the yard past the depot, then into a short siding to allow the locos to run around the train, and push the cars into a facing point switch and the two tracks. Those two tracks are in the stairwell, with the runaround track where the staging was going to be. The engineering of the extension had to take the drawbridge into account which thankfully clears with about an inch of space. Another update is for Courtenay. We weren’t happy with the number of moves needed for turning a Courtenay train and decided to do something. 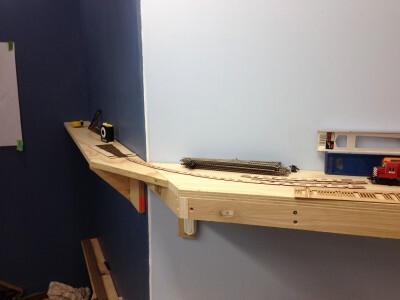 We’ve extended the siding track around the corner and it’s now long enough to account for a standard length train. Unfortunately the spur for the CP Express building at Courtenay is now single-ended as a result, but an acceptable compromise. The tail track is still long enough for a pair of locos, the water car and caboose. Work continues on these. All shells have paint and most decals applied but still needing more, like frame dots, warning labels, etc. 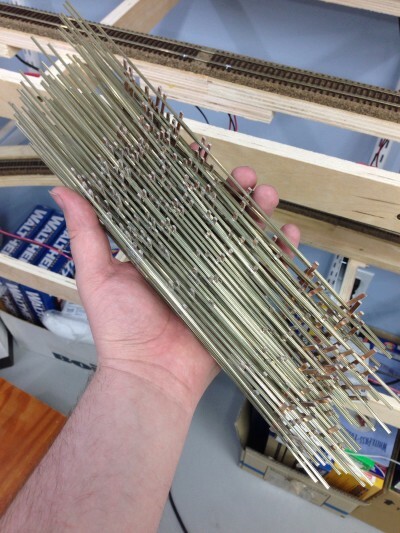 Work on the chassis still needs to happen in addition to decoder/lighting installs. I’ve spent more than a few hours at Kevin Pyle’s drill press and have made quite a few poles. Sadly, only enough for about half a car’s worth! SUPERTRAIN, Canada’s largest model train show, is an event which I assist in organizing, happened a couple weekends ago. This year, the show was held only a few minutes walk away from my house and I took the opportunity to host an open house for a few friends visiting from out of town. Was surprised when they brought a few other friends. I’m rather proud that I had manufacturers (well, at least their reps) galore looking at my layout. Scott from Bowser, Matt from ESU, Jeff from Prairie Shadows, Dan from Rapido Trains, Grant from Southern Alberta Rail, and always, Michaelea from Sign Reflectionz. Cam, Mark Kaluza, Josh Anderchuk and Matt Soknacki were also there and fun was had by all. Next year guys, the trackage will be completed! This entry was posted on April 30, 2015. It was filed under Benchwork, Trackwork. I bought one of the LRC’s from Rapido, so that has a train of Mk 1’s behind it, and my 9 year old has enjoyed running it a fair amount. I still can’t see myself building a North American layout though.